You have a pool of tenants. They all meet the same criteria: good credit, stable income, and no criminal history. How do you narrow down your choice? After all, the best way to maximize the ROI on a rental property is to find a great tenant and keep them in the rental. Landlords in highly competitive markets like New York City, Chicago, Seattle, and San Francisco all face a similar dilemma, how do they choose a qualified tenant out of a large pool of seemingly identical applicants? What else should they consider? TurboTenant asked over 20,000 landlords about their process for choosing the ideal tenant. While the number one suggestion is always to screen the tenant, essential tips on how to look beyond the hard data to interpersonal or soft skills that are desirable in a tenant almost always came second. Though the particulars were varied based on the landlord’s criteria, a common thread revolved around identifying your individualized preferences and thinking about the relationship more like a partnership rather than a transaction. The following insights are a mixture of data-driven and experiential tips from successful landlords on how to find the perfect tenant match. Top landlords reported finding better tenants when they used an online rental application. Online applications also allowed them to start the process of narrowing down applicants much quicker. Meaning, with an extremely efficient and streamlined process of applying online, applicants who would send in inaccurate or partially filled out applications would usually be taken out of the consideration pool. It was all about the perceived effort each applicant exhibited, and that first impression was one of the most critical factors. Screening the tenant was the crucial first step in starting to gather hard data on prospective tenants. Almost every landlord reported requesting a screening report which would include a criminal background check, credit check, and eviction report. 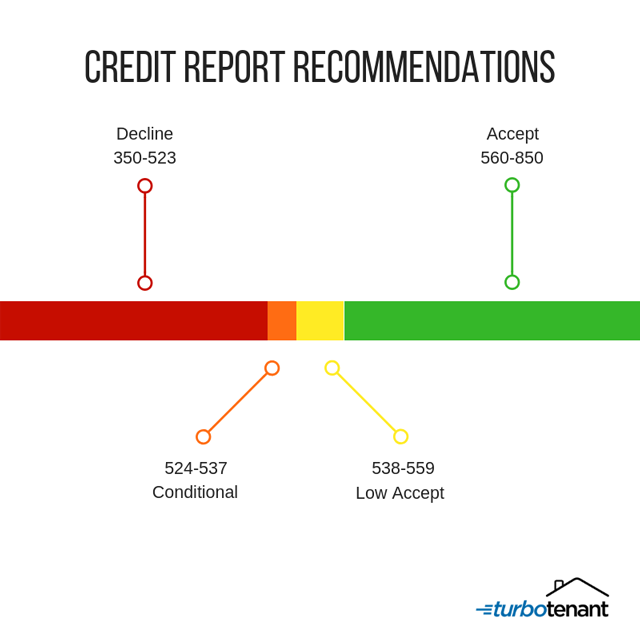 The graphic below illustrates the preferred credit score range for a tenant. Request references from previous landlords. Do a personal interview. Be patient and learn about the tenant. Spend as much time as you can with them. Build rapport. Review their social media channels and Google them. Look for qualities of honesty and integrity and trust your judgment. Tell them you will be running a credit and criminal background check. Do they object or offer excuses regarding what you might find? Check out the cleanliness of their car. Someone with a clean car may be more likely to keep your rental clean. The goal of the landlord-tenant relationship is to find a good match — a tenant that will treat your property with respect and have a long tenure there. By using a combination of the methods above and also customizing it to fit your needs, you will be able to foster a long and lucrative relationship. TurboTenant is an all-in-one, FREE property management tool that streamlines how landlords manage the rental process. Our rental marketing allows you to post across the web with a single click. You can collect online rental applications, and screen tenants (get credit reports and criminal background checks). Powerful and easy-to-use, TurboTenant saves time, money, and headaches. Perfect for the 1-100 unit landlord, property manager or real estate agent. It’s landlording made easy.